Languedoc-Roussillon is home to some of the most beautiful towns and villages in France. Many of them date back to medieval times and still have their original narrow streets and half-timbered houses. A car is a must on a holiday here if you want to properly explore the pretty villages and stunning countryside so if you're not driving to France; it's a good idea to hire a car locally. There are countless gites in Languedoc so the region is great destination for a self-catering holiday. Uzès is a beautiful town with a history stretching back as far as Roman times. Known for its stunning architecture and picturesque town squares and courtyards, Uzès is a wonderful place to spend a day. There are lots of pretty spots for an al fresco lunch or cup of coffee and the winding streets are fun to explore. The town is home to Le Duché castle and the guided tour through the building provides a great insight into its history. The tower in the castle grounds affords spectacular views over the town and surrounding areas so be sure to take a camera with you. A food-lover's paradise, Pézenas is full of tempting cafes, restaurants and bistros. There are also many independent shops and galleries, making this a great place to pick up a few souvenirs. The town was home to Languedoc's parliament for many years until the 1600s so there are lots of grand buildings and courtyards. A huge market takes place every Saturday and is well-worth a visit. 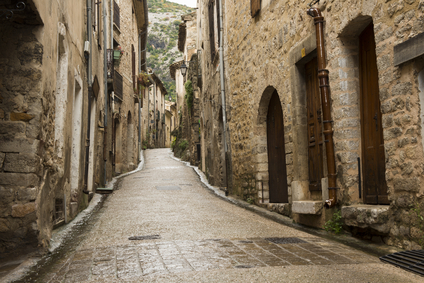 St Guilhem-le-Desert is a strikingly pretty village and sits at the bottom of a steep ravine. The atmospheric village centre is full of cobbled streets and charming little shops and cafes. Although it gets very busy in the summer months, it's a lovely place for a day out. A UNESCO World Heritage site, the village is well-maintained and many previously run-down buildings have been restored to their original glory. The town of Collioure sits right on the coast and feels very much like a seaside town. Situated around a pretty bay, the town provides a scenic setting for a day of leisurely walking. The rows of pastel-coloured houses make for pretty photos and add to the seaside feel. A wealthy town, there are lots of fine restaurants and up-market cafes here and prices can be high. If you're staying in one of the many self-catering gites in Languedoc, you might want to prepare a picnic to eat in one of the scenic spots around the bay.